Mornings are rushed and I should be the 'good parent' and say, my kids eat a healthy wholesome breakfast, but reality is very different. 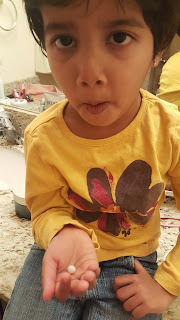 They are generally chugging milk down, or being coerced to finish the last few bites of the cereal/ oatmeal. every single weekday. I have no issues if they eat in the car, and fruits and the kids cereal bars are our go to energy boosters in case we are really running late or in between school and classes. I have a bag now in the car just dedicated to collect the orange/banana peels and cereal bar wrappers. And it gets filled up really fast! I used to feel guilty about this, now I dont. It is what it is! So yes, I am the best mom my kids can get! 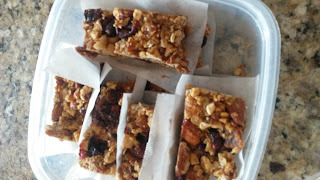 Recently I was wondering, these granola bars whould not be that hard to make! And well after researching eggless versions, i combined a few recipes to 'try making' this. Honestly, start to finish (except cooling time), it took my little lady and me only 20 minutes to make, which was really awesome! 1. Process dates in a food processor until small bits remain (about 1 minute). It should form a "dough" like consistency. 2. Toast your oats and the nuts in a 350 degree F (176 C) oven for 10-15 minutes or until slightly golden brown. Note: Toast them in different pans, its quicker! 5. Stir the warm butter and pour over oat mixture and then mix, breaking up the dates to disperse throughout. 7. Once thoroughly mixed, transfer to an 8x8-inch baking dish with parchment paper so they lift out easily. 9. Bake for another 15-20 minutes. Now this is optional step, i did make mine for additional crispiness. If you choose not to re-bake, please put this is refreigerator to cool. To store: I cut the parchment paper around each bar just to avoid them sticking to each other and also because I was feeling 'fancy' and kept in an airtight box.